Product prices and availability are accurate as of 2019-04-07 21:44:01 EDT and are subject to change. Any price and availability information displayed on http://www.amazon.com/ at the time of purchase will apply to the purchase of this product. This Stewart Elliott signed item is the perfect addition to a sports memorabilia collection. 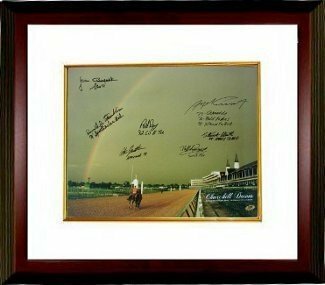 This Stewart Elliott Autographed Churchill Downs Kentucky Derby Winners 2004 Horse Racing Rainbow 16x20 Photo 7 signatures Deluxe Custom Framed - Signed Racing Collectibles comes with a Certificate of Authenticity and tamper-evident hologram. Your order ships in 1-2 days guaranteed. Sports Collectibles is your trusted source for authentic Stewart Elliott autographed memorabilia at the best price. 100% Authenticity Guaranteed! Genuine Authenticity Documentation Included Backed by Sports Collectible's certified authentic 100% money back guarantee. Perfect for any Sports Fan! Authenticity Guaranteed!